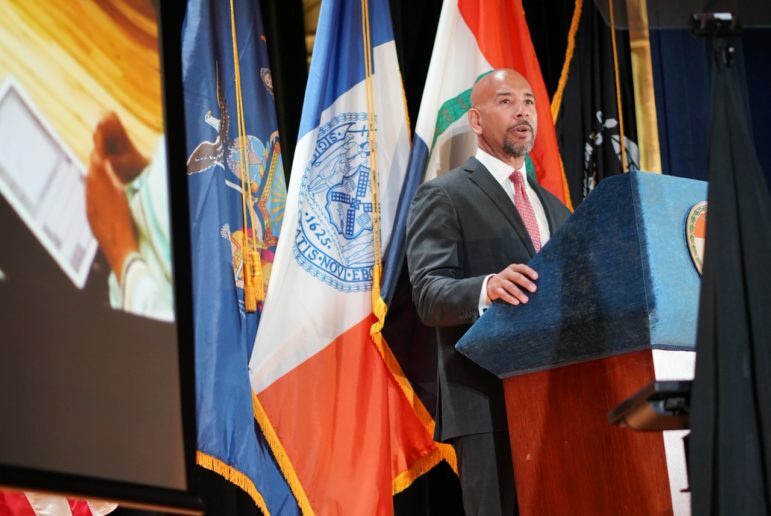 Bronx Borough President Ruben Diaz, Jr. gives his 2019 state of the borough address. Bronx Borough President Ruben Diaz says the de Blasio administration is needlessly pursuing an inferior and problematic site for the Bronx location in its borough jails plan. In an interview Wednesday on the WBAI Max & Murphy Show, the beep also talked about whether borough presidents need more power, indicated the solution to specialized high school segregation is more seats and talked about the vision for the city he’ll put forward as the 2021 mayoral campaign heats up. The City Planning Commission on Monday certified the city’s plan for four new jails, starting the Uniform Land-Use Review Procedure in which community boards and borough presidents offer advisory opinions before the Commission and the City Council take binding votes on decisions about zoning changes, alterations to the city map and deals involving city property. The new jails, which would be built between 2021 an 2027, would together provide 5,750 beds. Their construction would permit the city to close Rikers island, whose physical location and outdated facilities are blamed for fostering violence, exacerbating delays in case processing and deepening the damage of incarceration. A blue-ribbon commission in 2017 recommended new, smaller jails in each borough to keep people in city jails—the detainees who are awaiting trial and the inmates who are serving sentences—closer to courthouses and family. The mayor has not proposed a jail for Staten Island. In Manhattan, Queens and Brooklyn, new high-rise jails would sit adjacent to criminal courthouses. In the Bronx, however, the chosen site at what is currently an NYPD tow pound on 141st Street in Mott Haven is about a two-mile drive from the criminal courthouse on 161st Street. Diaz—who insists “I am in favor of closing down Rikers Island. I want to be unequivocal about that”—has opposed using that site, arguing that the location is better suited for other development ideas that neighbors would welcome. He’s also said that the proposed Bronx location undermines one rationale for the borough jails by being some distance from the courthouse (although it would still be closer than Rikers or the jail barge that has long been berthed along the Bronx shoreline). The Bronx beep has proposed an alternate site—the current location of the Family Court building on 161st Street. De Blasio administration officials say that site is too small. Diaz disputes that conclusion. Patrick Gallahue, a spokesperson for the Mayor’s Office of Criminal Justice, tells City Limits that, even with the extra territory Diaz mentions, the site on 161st would require a more intrusive building. The proposed Bronx site has always been the shortest of the proposed jails, and now stands at 245 feet after the administration reduced the height of all four sites. The Manhattan site is a full 205 feet taller. ULURP, SHSAT … M of NYC? The beep also criticized the city’s decision to hold one ULURP process for all four sites; the administration says it’s taking that unusual step because the four jails are inextricably linked. Should one site not materialize, the rationale for the others would evaporate. Right now in the ULURP process, a borough president like Diaz only has an advisory opinion. Asked if he thought the charter revision commission should consider changing that. Diaz indicated he was working on recommendations to change ULURP, but offered few details. Hear our conversation with Diaz below. It ends with him talking about the vision for the city he will put forward in 2021. Or listen to the full show, which includes an interview with Pratt Center’s Elena Conte about the possible adoption of comprehensive planning.